This attractive white linen shade has brushed nickel accents at top and bottom for a rich, contemporary look. The drum-style shade has a frosted glass diffuser on the bottom to reduce glare, and installs flush to the ceiling. Modern bath light with matching wall plate and hardware. The vanity bar can be mounted up or down to suit your personal style. The fixture is finished in rubbed oil bronze which matches most home styles. 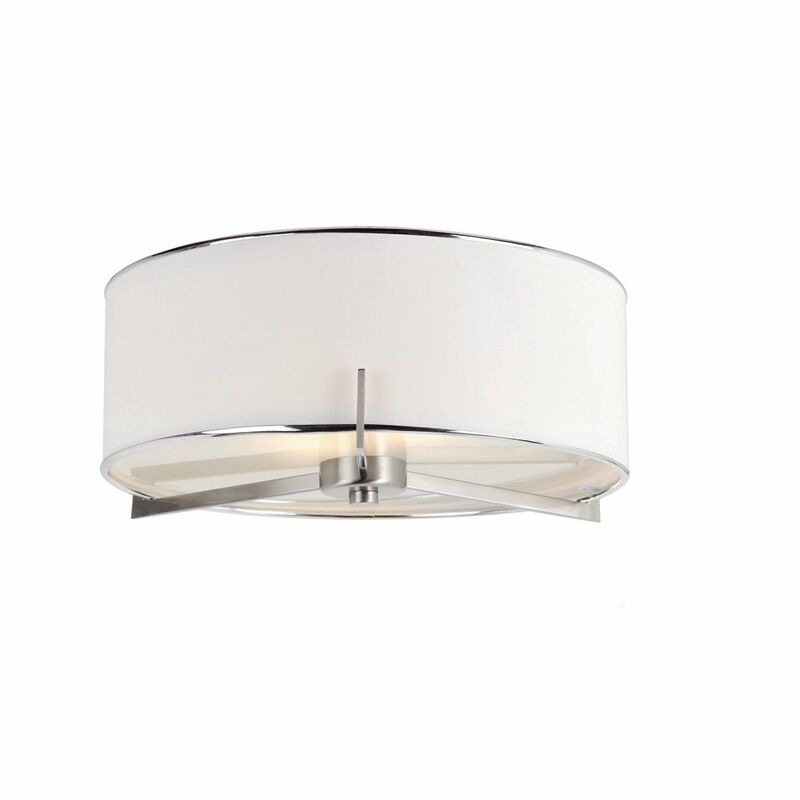 Ashley 2-Light 15-inch Round 60W Brushed Nickel Flushmount Light Fixture with Linen Shade This attractive white linen shade has brushed nickel accents at top and bottom for a rich, contemporary look. The drum-style shade has a frosted glass diffuser on the bottom to reduce glare, and installs flush to the ceiling. Ashley 2-Light 15-inch Round 60W Brushed Nickel Flushmount Light Fixture with Linen Shade is rated 4.0 out of 5 by 6. Rated 4 out of 5 by Pholobow from Perfect for my home Product was exactly like the picture. I was very happy with it. Rated 3 out of 5 by Rippydog from Mixed feelings about this light Bought 4 lights and had to repair 3 of the 4. The first had one light socket that was not attached to the mounting tab. Found the screw in the packaging but not the nut. I was lucky as I had a spare nut in my workshop. As to the second light; the mounting strap that is used to mount the light to the junction box had the holes for the light drilled oversize so the mounting screws would not screw in to it. I had a spare strap in my shop from an old light fixture. On the third light the mounting strap did not have the holes for mounting the light tapped to receive the mounting screws. I have a tap and die set and was able to thread the holes. The lights look nice mounted but be prepared to possibly have to repair the lights before mounting them. Since they are an online only purchase you can't simply return a defective or incomplete light to your nearest store or go to the store for parts. Rated 5 out of 5 by Lcamp from Great value Looks beautiful, easy to install! We’ve ordered 3more! Will 2x A21 bulbs fit in this light?